Below you will find a list of discussions in the Galaxy Nexus General Discussion forums at the Galaxy Nexus Forum - Samsung Galaxy Nexus Community. 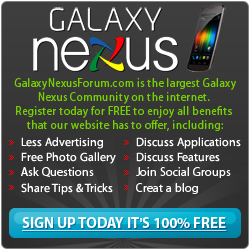 The Galaxy Nexus General Discussion forum is for discussion of: General Discussion area for topics involving the Galaxy Nexus that do not fit into more specific categories..
General Discussion area for topics involving the Galaxy Nexus that do not fit into more specific categories. Sticky: Screenshots of your Galaxy Nexus home screens!!! GNex unbelievable slow - why? can I change the boot animation without rooting? Galaxy Nexus won't boot up! Restarting after google logo!